This month, for Diabetes Awareness Month, I decided to take the National Diabetes Awareness Photo-a-day Challenge instead of doing the FMSphotoaday. So, here they are. Picture links to descriptions and full project. Justin got home from his mission on Tuesday, November 27, 2012. We are all so happy to have him back. He's been doing pretty well adjusting to regular life again. I did the Utah Human Race (5K) in the morning on Thanksgiving day. I just wanted to do a little exercise and it was nice to be able to help out the Utah Food Bank too. There were 5,200 runners and they donated over $150K to the food bank. I hadn't run in WEEKS but I did fine and ran the whole race without walking. and green beans for Thanksgiving dinner. Evan said, "Mom, you need someone to test these rolls". So I let the boys each sneak one before dinner. We went to my parent's house for dinner. Jess & her family were with her in-laws so it was just the six of us. Dinner was awesome and we had a nice relaxing time hanging out together. November is Diabetes Awareness Month. I want to be more involved than I was last year, and build on that each year. I've participated in the National Blogging Month NaBoPoMo challenge on my family blog before. 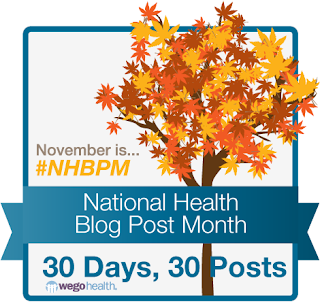 I doubt I'll be able to blog all 30 days but if you think that you can blog about your health each month, here's a place where you can receive a prompt. I'm going to give it a shot. I'll see how close I get. Maybe I'll commit to one per week. Diabetes is an illness which affects almost 26 million people globally. I was diagnosed with Type 1 in 2001. It's a challenge in my every day life. It is manageable, but there is so much more which can be done. In an effort to raise awareness (this is Diabetes AWARENESS month after all) I've decided to point you in the direction of a few ways you too can participate.